After a public fund-raising exercise in the town in the 1980s, the Perks and Llewellyn chemist shop was reconstructed at the Museum, complete with its mahogany fittings, bottles, jars and ephemera as a unique and original representation of a Victorian chemist’s (part of which is now on display) at Hitchin Lavender. To complement the shop, a garden of medicinal plants was created from a patch of lawn between the Museum and Paynes Park. This is no ordinary physic garden, for in its design and planting a whole history of Hitchin is displayed. To demonstrate the uniqueness of this garden, let us look first at its design. The garden has a pleasing balance of York stone paths, borders, Victorian benches and a unique and unusual sundial forged in bronze from a large pestle and mortar. Framed by cast iron railings, a Yew hedge gives the garden a feeling of enclosure and intimacy. These railings, together with the handsome cast iron gates were forged at Henry Isaac’s in St Ippolyts. The well-proportioned York paving was rescued from the Priory when a car park was being constructed on the site of a derelict Gertrude Jekyll sunken garden. The two cast iron benches much used by visitors, especially at lunchtime, are based on a grape vine design and again were cast by Henry Isaac. The borders are divided into categories – external ailments, internal ailments, household and culinary usage. In total there are 100 different species of plant in the garden. The local connection continues. Hitchin’s once important lavender industry is represented by a swathe of Hidcote lavender edging the central path. The two central borders are dedicated to William Ransom and contain plants grown by this Hitchin chemist and farmer in the fields around the town to use in his chemist shop in the early 19th century ’ field poppies, marigolds, chamomile, aconite and Pasque flower. To add to his range of pharmaceutical preparations, William Ransom established contact with merchants who imported plants from all over the world in the form of roots, bark and stems, and some of these plants can also be seen in the William Ransom borders ’ Coneflower (Echinacea), Elecampe, Bistort, Podophyllum and Cascara. Ransom’s today is a thriving modern company producing a wide range of drugs, medicines and galenicals for the food, cosmetic and pharmaceutical industries ’ all plant based. It was important that the garden should be as colourful as possible and also easy to maintain. Some medicinal plants, although wild flowers in their natural habitat, are nothing but dull, nuisance weeds in a garden situation. With careful selection, and taking into consideration the light, free-draining soil that we have in Hitchin, a collection was devised that is colourful and well behaved. Some plants are familiar as garden plants – foxglove, paeony, pansy, strawberry, Solomon’s seal – but their medicinal use came much before their ornamental use in our gardens. There is not a month in the year when something is not in flower – even in mid-winter, but the garden comes into its true glory in the early summer when the rose hedges are in bloom. These were deliberately placed adjacent to the pavement leading to the Museum and Library. Two species were chosen: Rosa gallica – the Apothecary’s rose &ndash and Rosa damascena – the Damask rose, used in the making of Attar of Roses. Both have heady perfumes and when in full flower their scent wafts across the path to delight passers-by. Add to this spectacle the strong colours of the lavender, the field poppies, the dyer’s greenweed, the marigolds and the foxgloves and few passers-by can resist turning their heads to look. 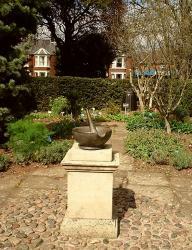 The Hertfordshire Medical and Pharmaceutical Museum Trust was formed in the late 1980s to ensure the future of the garden and the chemist shop. Thirteen years on the garden will undergo extra maintenance this winter in terms of replacing or dividing overgrown specimens and replenishing the soil. Normal maintenance is carried out by a team of dedicated volunteers who work for just one or two hours a week on a rota basis and it is thanks to them that the garden is cared for and thus appreciated by its visitors. There are not many times in the day when someone isn’t wandering around the garden or sitting on the bench enjoying this little colourful and scented oasis in town. Local school children visit to draw from the information provided about the plants and the part they have played in the medical and pharmaceutical history of this town. A Lavender Fair is held each year with the garden as a centrepiece. There is a Vi Lewis Memorial Lecture during the Hitchin Festival where a guest speaker is invited to talk on a subject relating to medicinal plants, and regional television companies make regular visits to film the garden for a topical feature. 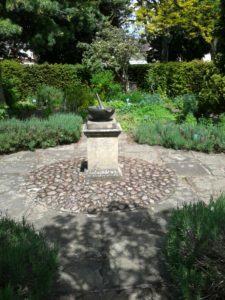 In creating this unique garden not only is Hitchin’s history of plant medicine preserved but also an amenity has been given to the town for all to enjoy.